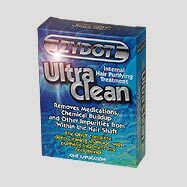 Zydot Ultra Clean Shampoo and Conditioner is a hair cleansing treatment that takes away the medications, impurities and other such chemical accumulations stored inside hair shaft. The shampoo is appropriate for hair equal to five inches. Longer hair requires more than one package of Zydot Ultra Clean Shampoo and Conditioner. Toxins get stored in hair follicle, for longer periods or unless the hair is cut. At the time of testing, the examiner cuts off the hair sample from the back of the head, close to the scalp. Thereafter, the hair sample is sent to the lab, where it is dissolved through organic solvents removing the toxins. Zydot Ultra Clean Shampoo and Conditioner covers up the hair similar to organic layer or completely remove the toxins. It is simple to use, reliable, and completely untraceable. It is an exclusive cleansing shampoo combined with conditioner and purifying agents. Zydot Ultra Clean Shampoo and Conditioner main constituent is Aloe Vera, which is very vital in the conditioning of scalp and hair. The penetrating agents help in getting rid of the impurities. The conditioner made up of Aloe Vera further adds sheen, and makes the hair tangle free. The shampoo promises to give best quality products developed from premium natural constituents. 1. Shampoo: It helps in eliminating the outside barriers, so as to uncover the inner hairs. The shampoo removes the blocks created due to styling, hair spray, daily buildups and finished products exposed to the internal hair. 2. Purifier: This penetrates deep inside the hairshaft and, removes as well as dissolves the pollutants. Further, it helps in releasing the medications and chemical accumulations inside the hair. The purifier in true sense makes the hair pure, clean and free of any unwanted pollutants. 3. Conditioner: It adds shine to the hair and also, controls it from getting tangled. Overall, it improves the manageability of the hair. Zydot Ultra Clean Shampoo and Conditioner is required to be utilized on the same day that is preferred for cleaning. It is advised for heavy users to make us of Zydot Ultra Clean Shampoo and Conditioner, two times consecutively to ensure a complete purification procedure.